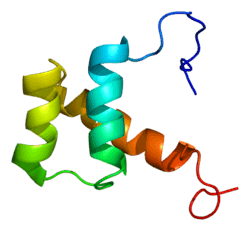 Homeobox protein DLX-5 is a protein that in humans is encoded by the distal-less homeobox 5 gene, or DLX5 gene. DLX5 is a member of DLX gene family. This gene encodes a member of a homeobox transcription factor gene family similar to the Drosophila distal-less (Dll) gene. The encoded protein may play a role in bone development and fracture healing. Current research holds that the homeobox gene family is important in appendage development. DLX5 and DLX6 can be seen to work in conjunction and are both necessary for proper craniofacial, axial, and appendicular skeleton development. Mutation in this gene, which is located in a tail-to-tail configuration with another member of the family on the long arm of chromosome 7, may be associated with split-hand/split-foot malformation. DLX5 also acts as the early BMP-responsive transcriptional activator needed for osteoblast differentiation by stimulating the up-regulation of a variety of promoters (ALPL promoter, SP7 promoter, MYC promoter). Mutations in the DLX5 gene have been shown to be involved in the hand and foot malformation syndrome. SHFM is a heterogenous limb defect in which the development of the central digital rays is hindered, leading to missing central digits and claw-like distal extremities. Other defects associated with DLX5 include sensorineural hearing loss, mental retardation, ectodermal and craniofacial findings, and orofacial clefting. In mice, the targeted disruption of DLX1, DLX2, DLX1/2, or DLX5 orthologs yields craniofacial, bone, and vestibular defects. If DLX5 is disrupted in conjunction with DLX6, bone, inner ear, and severe craniofacial defects are prevalent. Research utilizing Dlx5/6-nulls suggests that these genes have both unique and redundant functions. DLX5 begins to express DLX5 protein in the facial and branchial arch mesenchyme, otic vesicles, and frontonasal ectoderm at around day 8.5-9. By day 12.5, DLX5 protein begins to be expressed in the brain, bones, and all remaining skeletal structures. Expression in the brain and skeleton begins to decrease by day 17. DLX5 has been shown to interact with DLX1, DLX2, DLX6, MSX1 and MSX2. ↑ Simeone A, Acampora D, Pannese M, D'Esposito M, Stornaiuolo A, Gulisano M, Mallamaci A, Kastury K, Druck T, Huebner K (Mar 1994). "Cloning and characterization of two members of the vertebrate Dlx gene family". Proceedings of the National Academy of Sciences of the United States of America. 91 (6): 2250–4. doi:10.1073/pnas.91.6.2250. PMC 43348 . PMID 7907794. 1 2 "Entrez Gene: DLX5 distal-less homeobox 5". 1 2 "Homeobox protein DLX-5". ↑ Shamseldin HE, Faden MA, Alashram W, Alkuraya FS (Jan 2012). "Identification of a novel DLX5 mutation in a family with autosomal recessive split hand and foot malformation". Journal of Medical Genetics. 49 (1): 16–20. doi:10.1136/jmedgenet-2011-100556. PMID 22121204. 1 2 3 Robledo RF, Rajan L, Li X, Lufkin T (May 2002). "The Dlx5 and Dlx6 homeobox genes are essential for craniofacial, axial, and appendicular skeletal development". Genes & Development. 16 (9): 1089–101. doi:10.1101/gad.988402. PMC 186247 . PMID 12000792. Bapat S, Galande S (Jul 2005). "Association by guilt: identification of DLX5 as a target for MeCP2 provides a molecular link between genomic imprinting and Rett syndrome". BioEssays. 27 (7): 676–80. doi:10.1002/bies.20266. PMID 15954098. Scherer SW, Poorkaj P, Massa H, Soder S, Allen T, Nunes M, Geshuri D, Wong E, Belloni E, Little S (Aug 1994). "Physical mapping of the split hand/split foot locus on chromosome 7 and implication in syndromic ectrodactyly". Human Molecular Genetics. 3 (8): 1345–54. doi:10.1093/hmg/3.8.1345. PMID 7987313. Eisenstat DD, Liu JK, Mione M, Zhong W, Yu G, Anderson SA, Ghattas I, Puelles L, Rubenstein JL (Nov 1999). "DLX-1, DLX-2, and DLX-5 expression define distinct stages of basal forebrain differentiation". The Journal of Comparative Neurology. 414 (2): 217–37. doi:10.1002/(SICI)1096-9861(19991115)414:2<217::AID-CNE6>3.0.CO;2-I. PMID 10516593. Yu G, Zerucha T, Ekker M, Rubenstein JL (Oct 2001). "Evidence that GRIP, a PDZ-domain protein which is expressed in the embryonic forebrain, co-activates transcription with DLX homeodomain proteins". Brain Research. Developmental Brain Research. 130 (2): 217–30. doi:10.1016/S0165-3806(01)00239-5. PMID 11675124. Sasaki A, Masuda Y, Iwai K, Ikeda K, Watanabe K (Jun 2002). "A RING finger protein Praja1 regulates Dlx5-dependent transcription through its ubiquitin ligase activity for the Dlx/Msx-interacting MAGE/Necdin family protein, Dlxin-1". The Journal of Biological Chemistry. 277 (25): 22541–6. doi:10.1074/jbc.M109728200. PMID 11959851. Willis DM, Loewy AP, Charlton-Kachigian N, Shao JS, Ornitz DM, Towler DA (Oct 2002). "Regulation of osteocalcin gene expression by a novel Ku antigen transcription factor complex". The Journal of Biological Chemistry. 277 (40): 37280–91. doi:10.1074/jbc.M206482200. PMID 12145306. Okita C, Meguro M, Hoshiya H, Haruta M, Sakamoto YK, Oshimura M (Jun 2003). "A new imprinted cluster on the human chromosome 7q21-q31, identified by human-mouse monochromosomal hybrids". Genomics. 81 (6): 556–9. doi:10.1016/S0888-7543(03)00052-1. PMID 12782124.